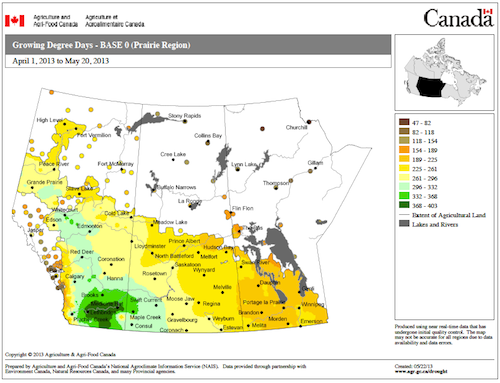 Seeding progressed rapidly in the past week across most of the Prairies. Excess dry conditions in some areas have growers wondering whether to seed deeper to reach moisture, and excess rain in others has growers wondering how long seed and seedlings can survive in waterlogged conditions. 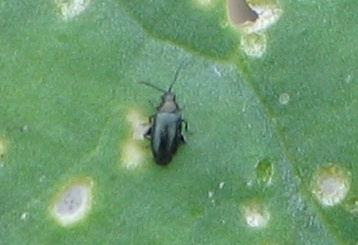 Flea beetles are present in some fields. Canola can tolerate 25% to 50% defoliation without a yield effect. This is the economic threshold. It makes economic sense to allow some feeding to occur, plus seed treatments require some feeding to provide control. Emergence can occur in less than a week with shallow seeding and warm moist conditions. That means a very narrow opportunity for post-seeding pre-emergence weed control. Early in-crop is the next best choice, especially if the field did not get a pre-seed burnoff. Try the seeding rate calculator: Alberta Agriculture’s seeding rate calculator is not designed specifically for canola, but works if you know target plant density, germination rate, thousand seed weight, percent mortality and row spacing. What is this insect, and why is it important? After the slow start, growing degree days (GDDs) are accumulating fast with warm weather. High winds can blow seeds and seedlings right out of the ground, especially if top soil is dry. If the field is not yet seeded, growers may want to seed a little deeper if topsoil is dry and high winds are still coming. Sprouting seeds are vulnerable to flooding/ponding damage as they require oxygen for respiration. The longer it takes for emergence after germination, the greater the chance of stand loss. Saturated soils may also retard or prevent germination because oxygen concentration is too low around the seed. If no germination has occurred, seeds can be cut in half to determine if turgor pressure is still present. If the seed is extremely soft and does not hold form, it probably won’t survive. The week after seeding is a good time to dig up seeds and seedlings to check for rots and blights. 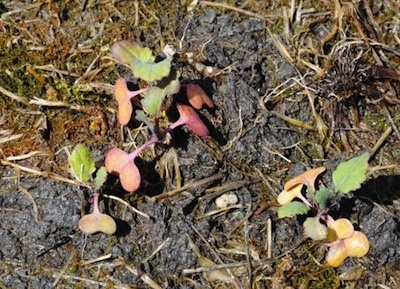 Disease damaged seed and seedlings die quickly, and may be gone within a few days, which is why this timing is important to an accurate diagnosis. For the first 21 days after emergence, scout regularly for flea beetles, cutworms, weeds, frost and many other possible threats to canola at this vulnerable stage. Assess flea beetle damage before spraying. 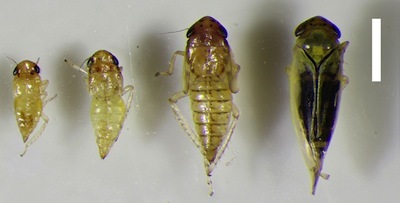 Some feeding is tolerated without an economic cost. 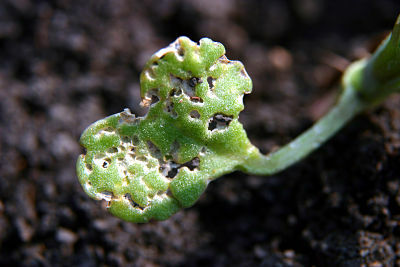 The nominal economic threshold for flea beetles in canola crops in Canada is an average defoliation of 25% (shown) or more of the seedling leaf area. It’s also important that flea beetles are present and continuing to feed.